The authority on worldwide tobacco distribution. Simply Click on the animated image on the left to log in (or view a FREE demo) of Tobacco Products International's DIGITAL EDITION - with full editorial content, searchable articles, and lots of exciting new features for our subscribers! 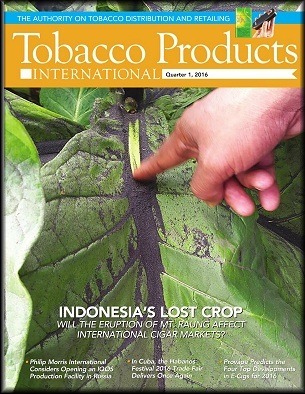 A regional eruption causes a devastating disruption for Indonesia�s tobacco farmers, who will feel the effects for years. The plant for the production of PMI�s heat-not-burn product, IQOS, the so-called �heat sticks,� may be launched in Russia, perhaps with state support. Cuba�s trade fair extrordinaire is dedicated to both the Hoyo de Monterey and Cohiba lines.